Vestibular paroxysmia is an episodic vestibular disorder which usually presents with a high frequency of attacks. This disorder was first described by Jannetta in 1975 as “disabling positional vertigo.” It is also known as microvascular compression syndrome (MVC). MVC is a syndrome of vestibular or positional auditory symptoms that respond to treatment with medications for neuralgia and in which other reasonable causes (i.e. Meniere's disease, migraine, labyrinthitis, fistula) have been excluded. The course of the disease is usually chronic (i.e. longer than three months) with some patients suffering hundreds of attacks per year. It is assumed that vestibular paroxysmia occurs due to compression of the eighth cranial nerve (otherwise known as the vestibulocochlear nerve) by an artery. 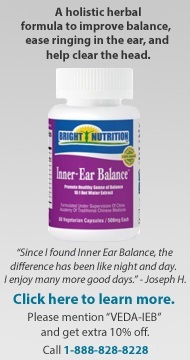 This nerve supplies the inner ear (which assists with balance) and the cochlea (the organ of hearing). Timothy Hain, MD, notes some controversy regarding the exact cause of this nerve compression, stating that symptoms seem to be due to nerve irritation, and that there are many other potential causes of nerve irritability besides vascular compression. He summarizes that the key features of this syndrome suggest an electrical problem. Thus, the exact cause of this nerve compression/irritation is unknown. Diagnosis of this condition is often based on the patient’s symptoms. It is important for your doctor to rule out other diagnoses, including Meniere’s disease, vestibular migraine, benign paroxysmal positional vertigo (BPPV), epileptic visual aura, multiple sclerosis (MS), stroke/ mini strokes, superior canal dehiscence syndrome, perilymph fistula, and panic attacks. MRI has been used to visualize the compression of the 8th cranial nerve. However the role of imaging to diagnose and identify the affected side is not clear, as there is a high rate of vascular compression of the 8th cranial nerve in healthy subjects. Doctors have found that treatment with anti-seizure medication (carbamazepine/ oxcarbazepine) has been shown to reduce the intensity, frequency, and duration of attacks. A positive response to these medications helps to support the diagnosis of vestibular paroxysmia. Surgical treatment is not recommended. If you are experiencing symptoms of vertigo, consult your doctor for more information. Strupp M, Hüfner K, Brémová T, Bayer O. A randomized double-blind, placebo-controlled, cross-over trial (Vestparoxy) of the treatment of vestibular paroxysmia with oxcarbazepine. J Neurol. 2018; 265(2): 291–298. Jannetta PJ. Neurovascular cross-compression in patients with hyperactive dysfunction symptoms of the eighth cranial nerve. Surg Forum. 1975;26:467–469. Hain T. Microvascular compression syndrome, Vestibular Paroxysmia, and Quick Spins. Dizziness and Balance Website. https://www.dizziness-and-balance.com/disorders/unilat/microvascular.htm. Accessed 1/29/2019.